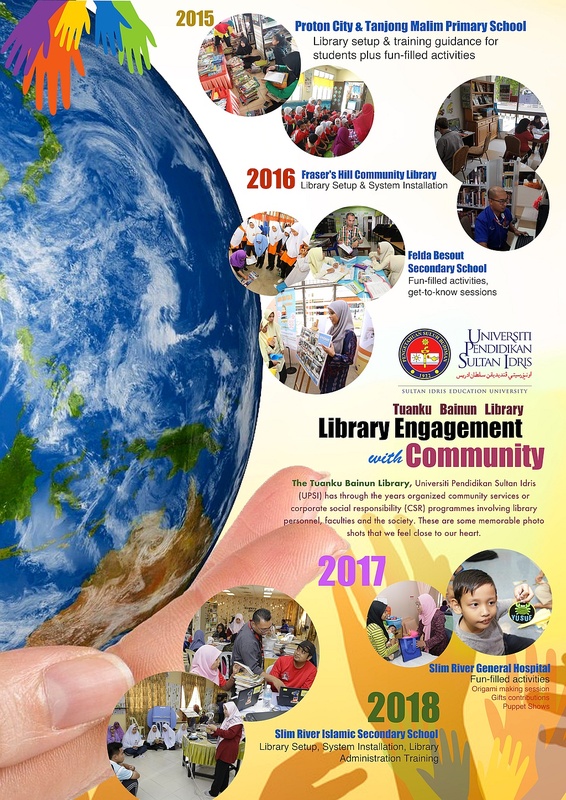 AHAMAD, Firdausiah and SAMIN, Mohd Hizam (2018) Library engagement with community. Paper presented at: IFLA WLIC 2018 – Kuala Lumpur, Malaysia – Transform Libraries, Transform Societies in Session 153 - Poster Session. The Tuanku Bainun Library of Universiti Pendidikan Sultan Idris (UPSI) has organised numerous corporate social responsibility (CSR) programmes involving library personnel, faculties and the society throughout the years. Library engagement with the community is crucial in this century where vast modern gadgets are available in the market and communication mainly occurs through social media. Libraries and librarians must play an essential role in informing and engaging with the public through reading and information literacy programmes, as well as enhancing the library services and facilities. It is important for the overall roles of librarians to be seen, in order to be relevant in assisting library users and society to access information for their needs. This is to inculcate reading culture and ICT literacy towards building a knowledge society in line with the government's life-long learning intiative. Hence, among the ongoing outreach programmes organized by Tuanku Bainun Library are library's CSR to (i) Slim River Hospital, Perak by extending psychosocial support for children aged 5-12 years and promoting library services while donating books to the Pediatric Ward; (ii) Sekolah Kebangsaan Tanjong Malim (SKTM), Perak in upgrading the resource centre, conducting library briefings and reading activities; (iii) Rohingya Community School, Kuala Lumpur upgrading the resource centre of the school and book donation; (iv) Sekolah Menengah Kebangsaan Agama Slim River, Perak in installing library system, ReCentSYS for students to access to the collection; and (v) Fraser’s Hill Community Library, Pahang in installing RECentSYS and assisting in cataloguing and classification of books at the community library. The programmes have been fruitful, becoming excellent trendsetter among the libraries in Malaysia.